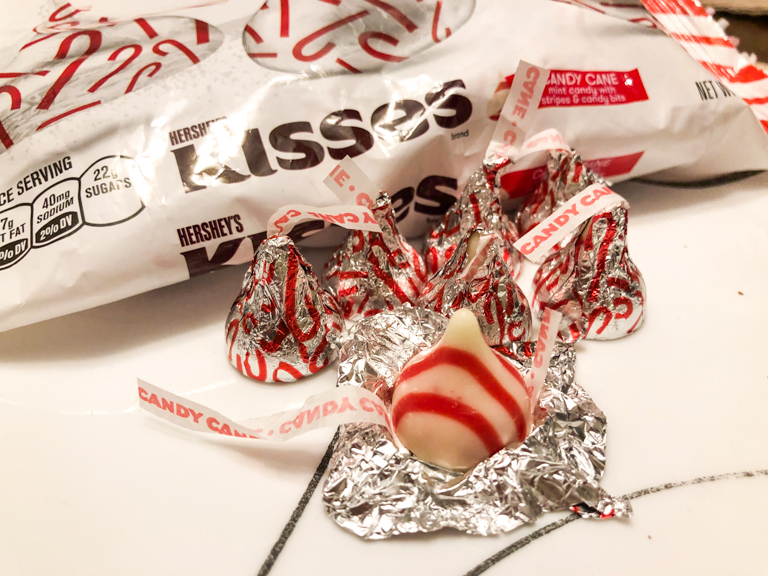 Last up, Holiday Hershey Kisses. Today we're trying 2 flavors. 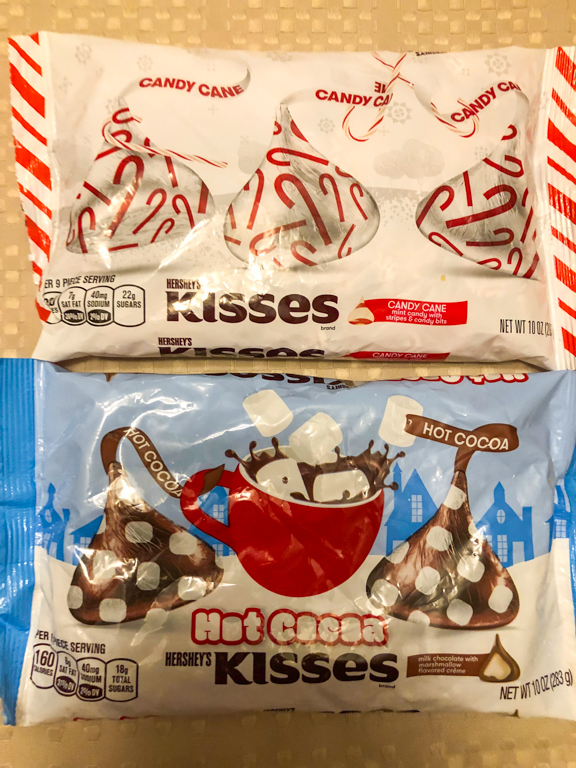 A Hot Chocolate Flavored kiss, and a Peppermint kiss. The front of the bags. First are the Candy Cane kisses. I thought maybe the decoration was limited to the packaging, but was happily surprised when I opened it. It's striped just like a candy cane would be. This mint flavored kiss included crunchy candy bits too. Even though white chocolate isn't my favorite, I liked this one. After everything was sampled, Alli looked over everything on the table and proclaimed these to be her favorite out of everything. Next were the Hot Cocoa kisses. 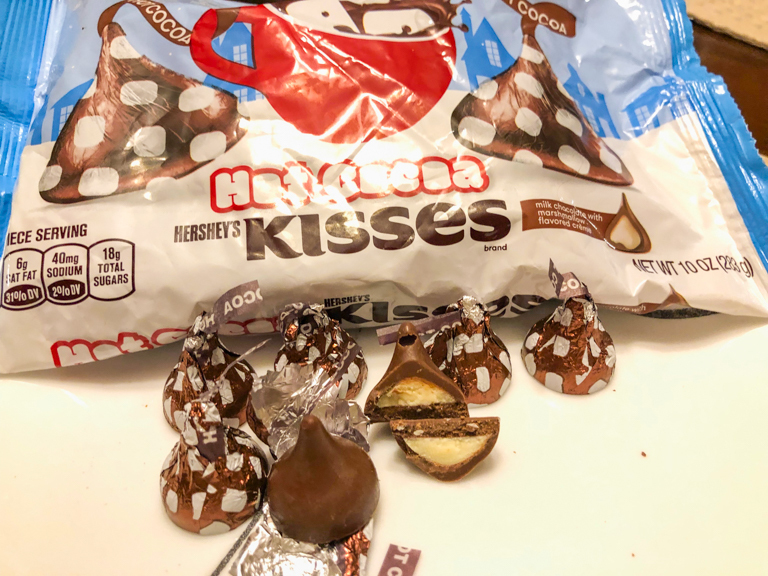 These are the regular milk chocolate kisses with a marshmallow flavored creme. I cut one open to show the camera. These kisses suffered the same problem as those Hot Chocolate Peeps, except now it's reversed. The Peeps are marshmallows with really artificial chocolate flavor. 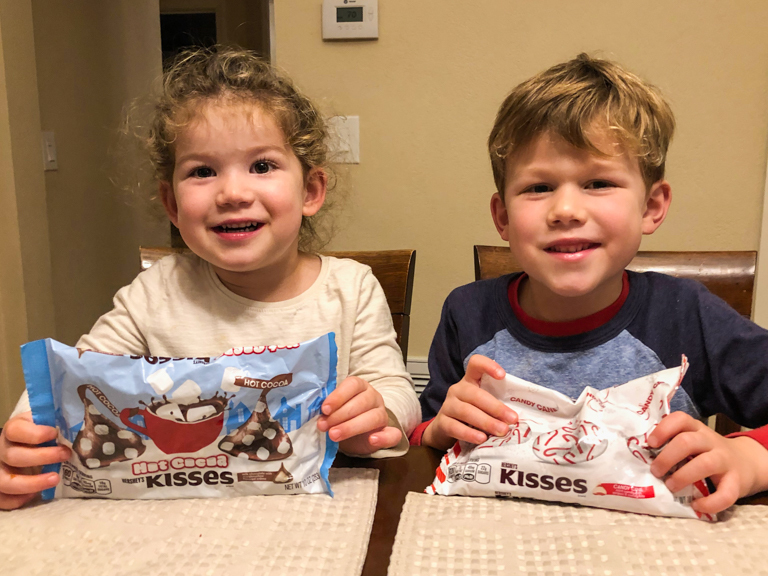 These kisses are chocolate with a really artificial marshmallow flavor. Meh. Not my favorite. Whew! That's a lot of treats! The kids certainly enjoyed it. If Alli's favorite is the peppermint kiss, what was Ian's? How did the rest of the Flowers household vote? Of all the descriptions (oreos, peeps, & kisses) to me, I'd vote for the peppermint kiss treat, myself! 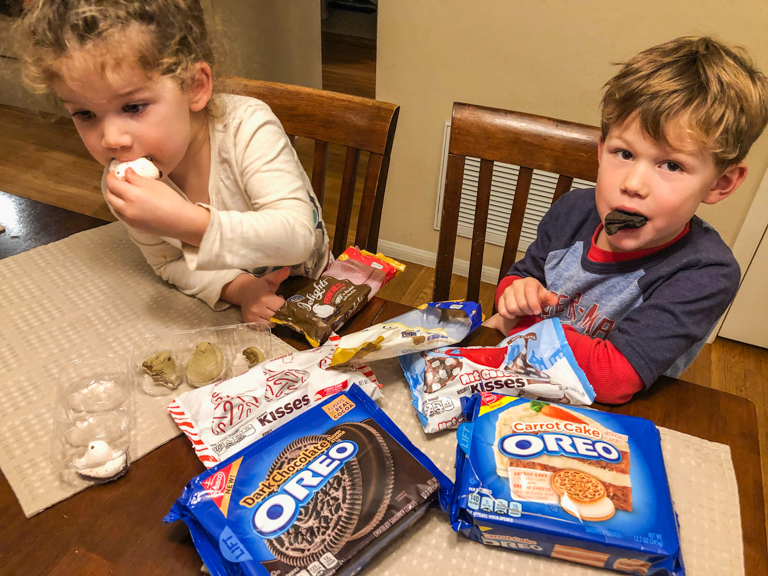 Ian went right back in to those Dark Chocolate Oreos when we were all done. He's on a big chocolate cake kick right now. I think the Carrot Cake Oreos were my winner. I really like cream cheese frosting. T didn't have a favorite, but there were some she disliked. Anything that tasted/smelled artificial. I had a fear that the Hot Chocolate ones would taste too fake. Seems like that's a flavor that might be best left to the real thing. Agreed. I wonder if real marshmallow fluff wouldn't hold up inside it.